Every day we make thousands of choices. I make thousands of choices. You make thousands of choices. What to eat. What to wear. What time to arrive. Whom to spend your time with. How to spend your time. What to care about. Many of these choices can seem inconsequential. Other choices seem monumental. Should I marry this person? Should I take this job and relocate? Should I buy a house? Whether we are faced with seemingly inconsequential decisions, or the decisions that alter the course of our lives, there is one factor that can change everything for us: control. Control of what? Control of people? Control of situations? Control of time, money, circumstances, information, or resources? The opposite of self-control is slavery. And no one wants to be made a slave. But sometimes we lose control of ourselves. And when that happens, we turn ourselves into slaves. If we can’t control our ability to drink, then we are a slave to drink. If we can’t control our temper, then we are a slave to our temper. If we can’t control our ability to spend, then we are a slave to impulse. If we can’t control our desires, then we are a slave to our desires. Self-control is a skill. Like learning to play piano, it needs to be studied, practiced, developed, honed, and maintained. And Lent is the perfect time to develop your self-control. The Christian practices of self-denial, fasting, and penance have all but been forgotten. The one exception to this is the practice of Lenten penance. Penance is the act of using our choices now to make up for the poor choices we have made in the past. Lent is a season when people readily give up meat, limit their meals, and even choose to give up some creature comfort. But many people just give up chocolate and fail to see the life-changing impact this season can have. 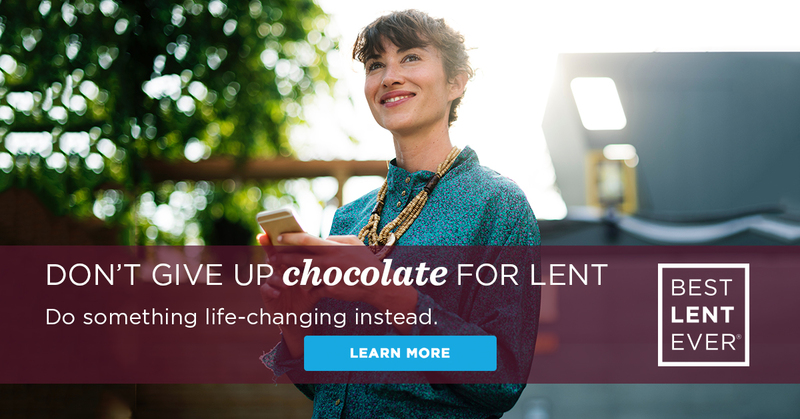 Why can Lent change your life? Because it’s the ultimate season for jumpstarting our self-control. It’s forty days, the perfect span of time to form new, life-giving habits and abandon some old, self-destructive habits. And it’s a season during which we are pre-programmed to practice self-denial. Forty days to change your life. What an opportunity! Let’s take a look at three of Lent’s built-in practices that we can use like a training regimen. These three practices are like your nutrition plan, weight lifting plan, and cardio plan. Each element is necessary. Can you do one without the other two? Absolutely. Will it make a difference? Sure. But doing all three will bring the life-changing results you are looking for. Start here, because it’s where we naturally start when we are thinking about Lent. When was the last time you wanted something, and could have it, but chose not to? Think back for a moment on how often you deny yourself. I think for most of us this is a pretty rare circumstance. So pick something you have, that you like, that you want, and choose not to have it. It is important to remember that fasting is primarily a spiritual exercise. I want to be really clear about this, because I’m not talking about times when we have to decide between two things we want. For example, I’m not talking about choosing between the salad and the burger for lunch. On the one side is my desire to be healthy, on the other is my desire for the taste and pleasure from the burger. Choosing the best of our desires is absolutely a kind of discipline we should build into our lives and we will talk about it in a moment, but it’s not the kind of giving up I’m talking about here. I’m talking about the comforts that we want, but don’t actually need. Listening to music in the car. Taking a hot shower. Having different outfits to wear. (One year a friend wore the same pants, shirt, and tie to work every day for Lent and washed them every other day.) These are the comforts we want, but don’t really need. And this is where we begin to train our will. So find your one small thing that you want, but don’t need, and give it up for Lent. It could be your morning coffee, or something like television or social media. Giving up some comfort that you want, but do not need, is a powerful tool to build your self-control. If you need a jump-start, here are some creative ideas to get you started. The Church has some very clear guidelines for how we should incorporate fasting as a Lenten observance. The how is simple, but what about the why? Fasting without the why is pointless. The purpose of fasting is to turn back to God. Missing that primary purpose makes fasting fruitless. Sure, fasting has become a popular secular practice for everything from medical treatments to weight loss, but these uses are secondary. Fasting is a sharp reminder that there are more important things in life than food. Lenten fasting helps to release us from our attachments to the things of this world. It is often these worldly attachments that prevent us from becoming the-best-version-of-ourselves. Fasting also serves as a reminder that everything in this world is passing. Go without food for several hours and you quickly realize how truly weak, fragile, and dependent we humans are. This knowledge strips away arrogance and fosters a loving acknowledgement of our utter dependence on God. It is important to remember that fasting is primarily a spiritual exercise. We do not fast to impress other people. We fast to build our self-mastery. Fasting is a means, but never an end. The benefits of fasting are innumerable, but all these benefits are secondary to the desire to embrace God more fully in our lives. Self-mastery is built through self-denial. This truth is fundamental to a thriving and exceptional life. Why? Because it is only through discipline and self-denial that we can achieve the self-control necessary to choose the-best-version-of-ourselves. Daily sacrifice should be a part of our everyday Lenten experience. This is where our salad vs. burger example from earlier comes in. Yes, we want the pleasure and taste from the burger, but we know that our desire to be healthy is more important. So choose the salad. It is the smallest thing. Nobody notices. And yet, by this simple action you say no to the cravings of the body that seek to control you. Lent is the perfect time to build these habits into your life. During Lent, you are already conditioned to go without: without food, without comfort. You have already chosen to intentionally give up some comfort in your life. You are already conditioned to seek opportunities to deny yourself. So use daily sacrifices to harness this predisposition into your daily life. Never let a day go by without practicing some small moment of sacrifice. Never let a day go by without practicing some small moment of sacrifice. Take public transportation to work instead of driving. Eat the salad instead of the burger. Take the stairs instead of the elevator. Let the guy merge, even though you are in a rush. Turn the thermostat down two degrees below your comfort zone. Are these acts small? Absolutely. Are they noticeable? Barely. But done with the right spirit, these small acts of daily sacrifice will build up over time into a habit that makes you dominant over your passions and whims. So when everyone else is stuck procrastinating, you will have the self-mastery to start. When everyone else is complaining about how cold it is outside, you won’t even notice. When everyone else overspends on the next tech thing they don’t really need, you will be content with last year’s model. This level of self-mastery is achieved by only a few. That is because it’s not a decision we can make overnight. Self-mastery is a skill that is built through our habits, and very few people have a habit of self-denial. So if you want Lent to have a life-changing impact, I invite you to use the time to practice the skill of self-control. Use Lent’s built-in practices of giving something up, fasting, and daily sacrifice to train your will and master your passions and desires. During Lent, your body and soul are conditioned for the work. Let the season empower you to a level of self-mastery that takes time and energy to build. If you do, the season of Lent will literally change your life forever. Join 400,000 others in becoming the best-version-of-yourself this Lenten season.